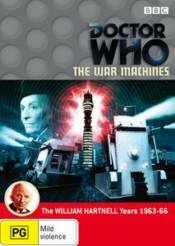 Starring William Hartnell as the first Doctor, this early four-part adventure is available on DVD for the first time. The story begins in London, 1966 and the TARDIS materialises in the shadow of the newly-completed Post Office Tower in London. Immediately the Doctor senses a strange energy in the air and is certain evil is at work nearby. Posing as a scientist, the Doctor and his 'secretary' Dodo (Jackie Lane) gain access to a suite at the top of the tower and meet the driven Professor Brett (John Harvey). His life's work, WOTAN � a revolutionary new supercomputer that can actually think for itself - is about to be linked up with computers from around the world to create an advanced problem-solving network. But WOTAN has its own agenda. Convinced that humans are inferior to machines, WOTAN is determined to create an army of war machines to take over the world. Can the Doctor find a way to outwit this menacing computer foe? Commentary with Anneke Wills and Director Michael Ferguson. Now & Then - featurette re-visiting the London locations used in the story and comparing them with how they were back in 1966. Narrated by Simon Ockendon. Blue Peter - A compilation of related articles from the popular children's magazine show. Valerie Singleton shows new stamps of the Post Office Tower. Christopher Trace goes to visit the tower and shows viewers how to build a model of it. A War Machine visits the Blue Peter studio. Schoolchildren bring in a Dalek they built at school. One Foot in the Past - Politician and ex-Postmaster General Tony Benn investigates the history of the Post Office Tower and is allowed up to the now-defunct revolving restaurant and onto the roof, in this extract from the BBC2 show. WOTAN Assembly - featurette explaining how the DVD was created from disparate sources, after the original series fell victim to overseas censorship in the sixties. Narrated by Anneke Wills.